Updated: corrected radio support for the L90. T-Mobile and MetroPCS today announced the availability of the LG L90 and L70 (pictured), devices that fall into LG's L Series III lineup. Both phones were revealed by LG earlier this year. The L90 and L70 run Android 4.4 KitKat with LG's user interface enhancements. The hardware puts LG's minimalistic design esthetic to use. Shared features include support for Bluetooth, GPS, and Wi-Fi. L90:The L90 is being sold by T-Mobile and supports the carrier's HSPA+ 4G network, but not LTE. It has a 4.7-inch qHD display, quad-core 1.2GHz processor with 1GB of RAM, 8GB of internal storage, 2,540mAh battery, and an 8-megapixel/1.3-megapixel camera configuration. It will be available beginning April 30 for $0 down with 24 equal monthly device payments of $9.50, or the full retail price of $228. L70: The L70 will be sold by MetroPCS. It steps the display down to 4.5 inches and 800 x 400 resolution, a dual-core 1.2GHz processor with 1GB of RAM, 4GB of internal storage, a 2,100mAh battery, and a 5-megapixel/VGA camera configuration. The L70 is available beginning today for $49 after a $100 instant rebate. For a limited time, MetroPCS will offer an additional $49 rebate to customers who pay for two months of service in advance. The L70 supports HSPA+, but not LTE. LG's latest L Series Android phone fills in T-Mobile's entry-level roster. The L90 is an LG phone through and through thanks to core features, but better options might be available. Virgin Mobile USA today announced a new plan that gives customers more flexibility in managing their account. Virgin Mobile Custom is based on the ItsOn platform, which was used by Zact Mobile, a Sprint-based MVNO. 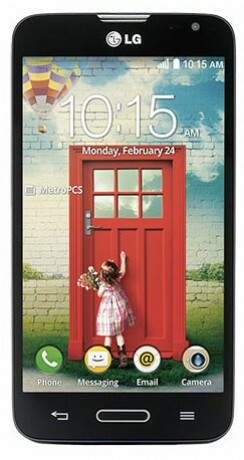 Cricket Wireless today announced the LG Optimus L70 smartphone will be available online and in stores beginning Friday for $50 after a $50 mail-in rebate. The L70 was announced earlier this year and is already being sold by MetroPCS and others. So, Metro gets the L70, as does Wal-Mart Family Mobile ($180), but no love for their own prepaid division? The only sector that was any growth for several quarters gets left behind again.